In celebration of the first Spring Training exhibition games of 2018, I’ve got something extra special to share for this week’s Fresh Fitted Friday: a 1994 Albany-Colonie Yankees cap. I'm glad to finally check this cap off my wishlist. Well, really it's just moving into the second tier because I'd like to eventually find one without the red button and eyelets but enough with the nitpicking! If you look closely you can tell that the tags that were ripped out are ones that were used from 1994-1996. Because the Double-A affiliate's last season in Albany was 1994, this cap could only be from that year. I've seen the MILB batterman on caps that could be from 1993 but I'm holding firm in my estimation that this cap is from 1994 due to the ripped out size tags used in the photo above this one. If you are familiar with my cap wishlist, you know most are there because I love their logo design but some are also there for the rarity. This cap meets both requirements but I especially appreciate that the team only wore this logo for their last four years in Albany. This cap reminds me of the many autographs I collected from Albany alumni when the Columbus Clippers came to play the Tidewater Tides however it lacks the gravitas of a Jackson Mets cap due to the organizational connection the Tides once shared with Jackson. Here’s an image of Derek Jeter wearing the Albany Yankees hat featured today. 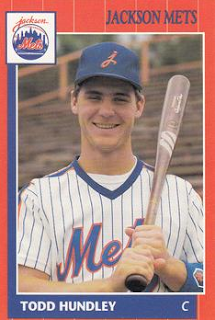 I can tell the year is 1994 as that was his only year in Albany and because he’s wearing the MLB 125th anniversary sleeve patch. Nostalgia is an undeniable force in the world of baseball cap collecting but it’s not always a good thing. If you don’t believe that, think of all the yahoos constantly lamenting the impending loss of Chief Wahoo from the Cleveland Indians cap. I imagine these folks will be sour grapes until they realize that something better usually comes around. If you need further convincing that the Cleveland Indians will be able to have a winning cap logo, look no further than the Spokane Indians and Indianapolis Indians. Each of those teams have histories over 100 years old and to my knowledge have not resorted to using offensive caricatures of Native Americans, and for sure not in recent years. This pertains to the Albany Yankees as they spent the first six years of their existence wearing a New York Yankees hat but as soon as they adopted the logo seen here today, a new identity was born. Sadly it only lasted until 1995 when they relocated to Connecticut to become the Norwich Navigators but in that move, the affiliate truly became its own brand. The point of mentioning all of this is that there are always going to be people who resist change but after a while they realize something as simple as a new logo can reinvigorate a club more than holding on to a relic of the past that should have been forgotten long ago. Another thing I’d like to say is that I’d be ecstatic if this cap logo got the retro treatment but I hope whoever is in charge stays true to its fundamental design aspects. Far too many times logos are inexplicably altered and the producer makes assumptions on details such as the color of the underbrim based on just that: assumptions. If you are reading this and are planning to retro this cap, note the logo measures 7 cm X 5.5 cm (WxH) and while the underbrim is grey, I think a green underbrim could work here. The New York Yankees were among the last teams to switch to grey underbrims in 1994, so I can see how they would encourage their minor league counterparts to hold out as well. While none of photographs I’ve seen of players wearing this cap definitively prove or disprove that notion, I did see an Albany snapback with a green underbrim listed on eBay but was not willing to pay the exorbitant asking sum for it. Disclaimer: this is not an image of a cap I own and the purpose of showing it is soley to point out the green underbrim in the image below. While there were some Double-A teams in the 1990's that supplied their teams with fitted caps, the majority of them played in snapacks due to their cost-effective nature. 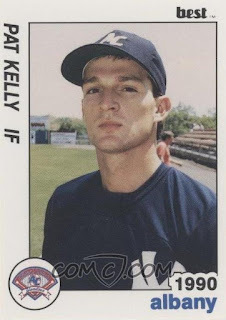 The lighting isn’t great in this 1990 Best card but I would guess Pat Kelly’s underbrim is green and probably a snapback as it probably wasn’t much different than the caps featured above. Here’s a 1992 Sky Box card featuring Albany coaches Dave Jorn and former-Yankees bench coach Rob Thomson. I wish Thomson all the success as 2018 will be his first year serving in that role in Philadelphia. Well, I hope you had fun reading about another Eastern League classic. This cap isn't for sale or trade however don't hesitate to reach out if there's something you like on the Trading Block and you are willing to part with any of the hats on my Wish List.